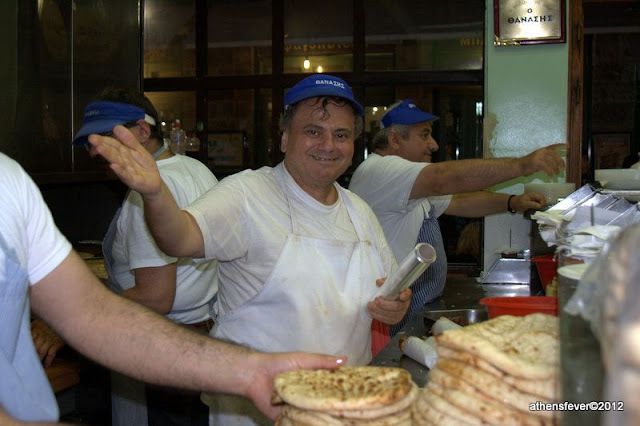 At the center of Athens near Syntagma square, "Tzitzikas kai Mermigas" restaurant offers Greek traditional dishes. 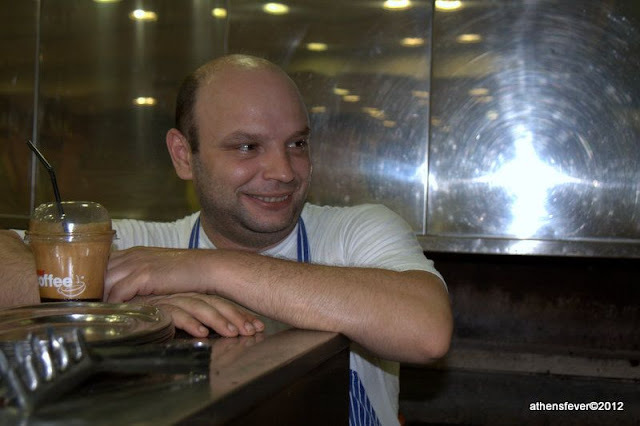 It is among the first restaurants to introduce the 'New Greek Cuisine' wave. 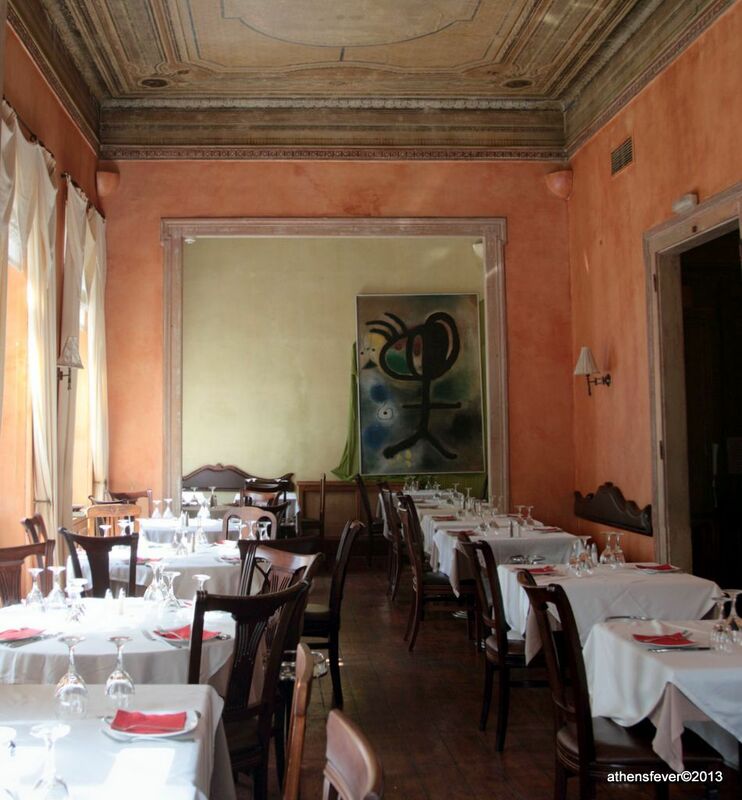 Indeed, the menu is more refined than a standard Greek 'taverna', making it a good choice for every gourmet. Tzitzikas kai Mermigas restaurant is also found at Kifisia and Xalandri. If you want to taste something different than Greek cuisine in Athens, then Altamira is the perfect alternative. There you''ll have the choice between Mexican, Arabian, Asian and Indian specialties. The restaurant located at Tsakalof 36, Kolonaki, offers a beautiful and calm atmosphere for a romantic dinner. Special deal: Every day, Altamira offers four menus for a special price of 19 euros. Each menu comprises an entry or salad, a main dish and a dessert. One of the four menus include only vegetarian dishes. Other option is the menu at 14,5 euros, it includes a main dish with a glass of wine or refreshment drink. 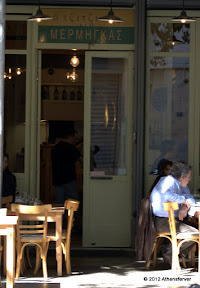 The restaurant is located in the northern suburbs of Athens on Kifisias. 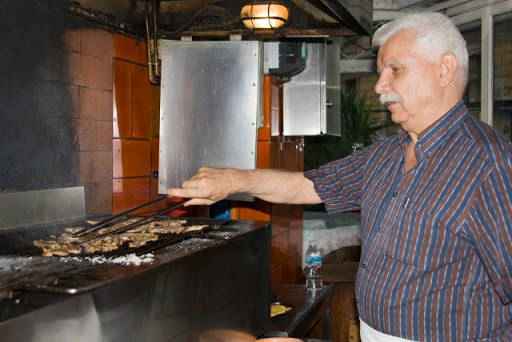 It offers Greek specialties like the "souvlaki", pork "gyros" and grilled versions of chicken, pork and veal. These are the kind of restaurants in Athens that specializes only in one dish. The "Minotavros" & "Telis" restaurants at Evripidou Street 86, serves only grilled pork chops. Each dish contains three chops with French fries. You may order a Greek salad with Feta cheese called "Xoriatiki". With half a liter of house wine, the all cost 13 euros a person. Evripidou Street area is not a touristic area. Although the restaurants are well known among Athenians, we usually don't hang out there late by night. The best time to go there is for launch the afternoon. The restaurants are best accessed by foot from Monastiraki station through the Psiri neighborhood [see map]. In Greek, Diporto means two doors. Indeed, this restaurant has two entry doors, one on Theatrou Street and the other on Sokratous Street. Once there, you'll just notice the doors, there are no any signs with the name of the restaurant. You'll have to walk down the stairs to discover the restaurant space with the lined up wine barrels. The restaurant specialty are grilled sardines with chickpea soup, there are also other two or three main dishes according to the day. The restaurant is very well known and referenced in many guides, so most probably you'll find a lot of tourists there. The restaurant is open for launch and usually closes between 05:00 pm and 06:00 pm. Location: Erechtheos Street 12, Plaka Athens. This Taverna has all to please a tourist. The atmosphere is relaxing and very quite. 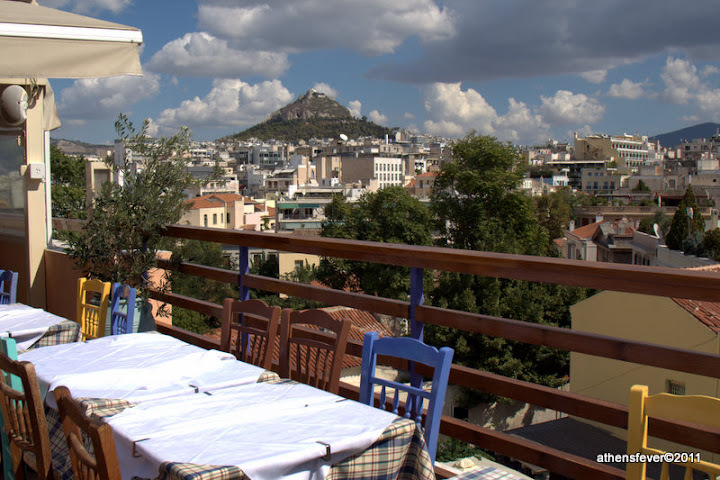 In summer time, some of the outdoor tables on the terrace offer a nice view of Athens Lykavitos Hill. The food is what you could expect from a traditional Greek Taverna, there you have the choice between sea food and other Greek specialties like grilled lamb chops, Pastissio, stuffed tomatoes and many more. 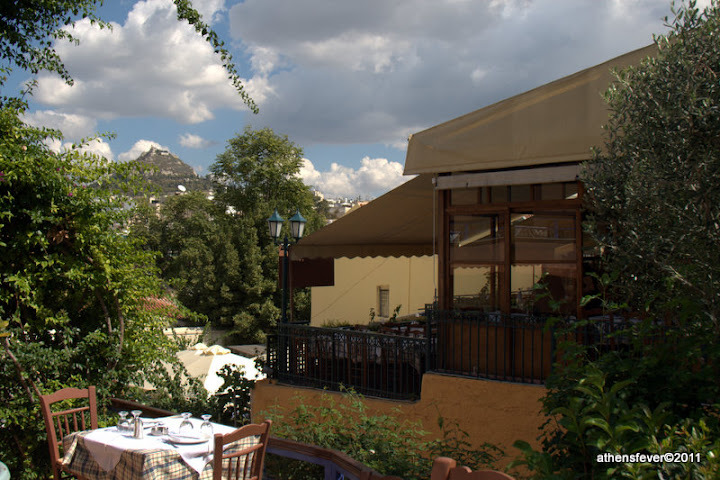 The restaurant is somehow difficult to find in Plaka, so make sure you use the map in the location link. Location: Mitropoleos 69, Athina 10552 Greece Transit: Monastiraki. 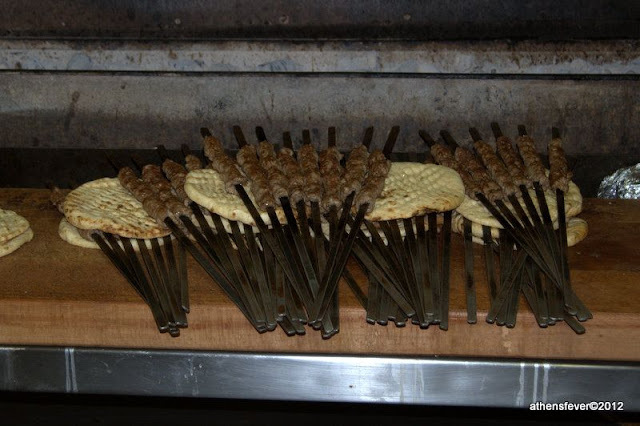 Thanasis restaurant is one of these places that serves only Kebab. You can have kebab either in a dish or in a sandwich with the so called Greek pita bread. The whole can be accompanied with a Greek salad, french fries or Tzatziki. This is a flavor of Greece that you have to taste. Location: Persefinis 43, Athens 11854, Greece Transit: Keramikos. At the center Gazi/Keramikos area, this contemporary design souvlaki restaurant serves all kinds of pita giro, salads snacks and sandwiches. Of course, you'll miss there the classical Greek environment of a taverna, but the quality is not bad for the price. At myplate, you'll feel you're going out for a drink but you end up eating a souvlaki. 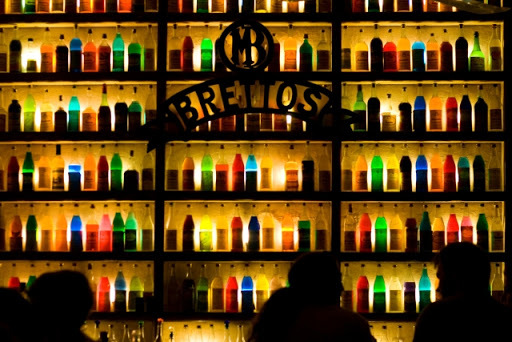 At the heart of Plaka, Brettos Bar offers to the visitor a delightful decoration with hundreds of colorful liqueur bottles all around its walls. At the bar you have the choice between more than 40 flavors of liqueurs, 7 star brandy, ouzo and wine. Brettos bar is a quite popular among tourists, since it is recommended in most of the guides and is mentioned in many articles. From Monastiraki metro station Brettos bar is a 13 minute walk across souvenirs shops and restaurants [ see map ]. 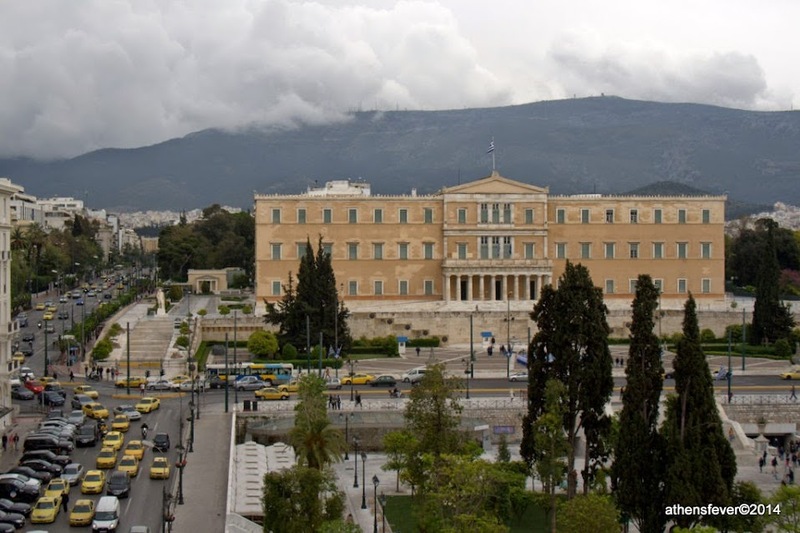 It is also very close to Syntagma Square. See also: Brettos 360 panoramic view. At the heart of Athens, the BlackDuck attracts the curious passing by. Indeed, this multi-level space regroups a coffee shop and a small bar on the first floor, a restaurant on the first floor and an art gallery in the basement. The place has a distinctly relaxed vibe with music not too loud. The crowd is mainly made up of locals of all ages from the middle and higher class. Upstairs the restaurant offers a menu of selected dishes with grilled chicken and steak, pasta, risotto, salads and sandwiches. Some of the appetizers are suitable to be degusted at the bar or the coffee shop. Live music events are common and announced regularly on the Black duck web site. Entering the James Joyce pub you'll forget for a moment that you are in Athens. With native English speaking staff and a great choice of draught beers this place has everything to remind you of an Irish pub. It is located near Thisio Metro station at Astiggos 12 Street, Thisio. 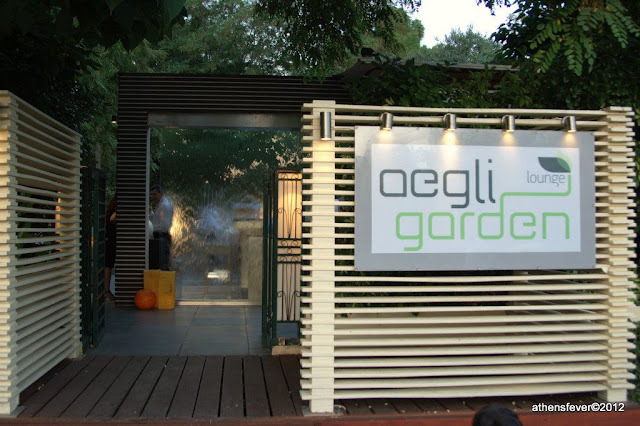 The Aegli Garden is an open air bar lounge in the center of Athens within the Zappeio Garden. It is the ideal place for a calm summer outdoor drink or cocktail after dinner. The bar attracts generally the high society of Athens. Parking is free and accessed from Vas. Olgas Avenue. The bar opens every day from 21:00. This bar is located in Piraeus, in a marina known in Greek as 'Pasha Limani'. It is part of the Piraeus Nautical Club which includes a restaurant, a conference center, and the infrastructure to support the club sailing activities. The bar is on a jetty structure well elevated from the sea level, offering a beautiful view on the marina with its sailing boats from one side. On the other side you have a view on the open sea, and the area of 'Palio Faliro' to 'Glifada' in the background. The bar is very trendy, it is generally full on weekends from the morning till late night. 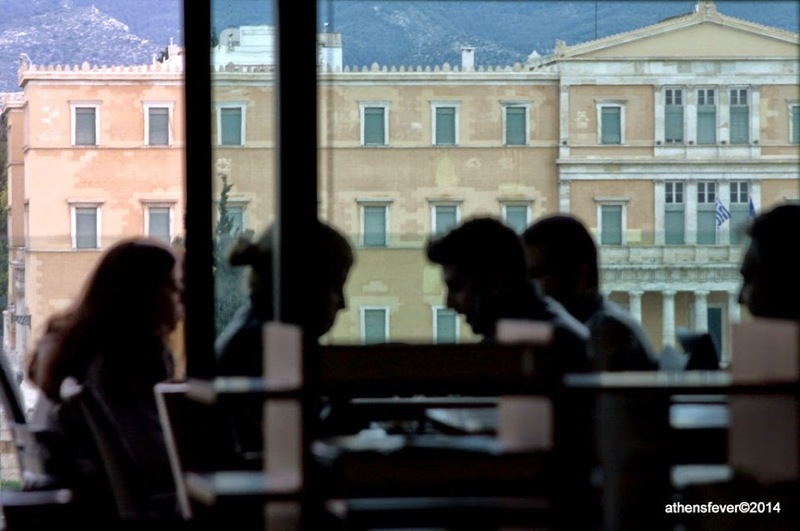 This is a Café bar with an exceptional view over the Syntagma Square. From the rooftop café at the 5th floor of the Public electronic store, you’ll be able to observe the busy streets of Athens center, the King George five star hotel, and the house of Parliament with Imitos mountain in the background. The atmosphere is relaxing; this is a meeting point for young people, some of the clients read the books they just bought from the bookstore the floor bellow, others are just visitors. The café works also serves launch. The menu is limited to some dishes; it is good but not exceptional. 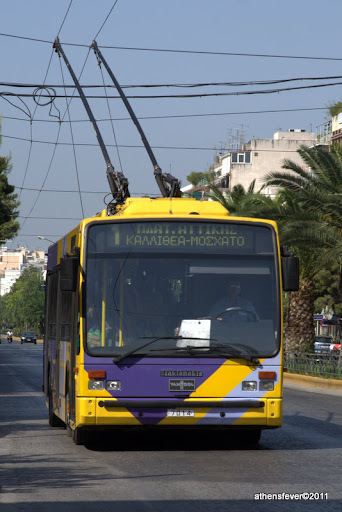 Metro line number 1: Pireus - Kifisia (Green line) or the Athens Piraeus Electric Railways (ISAP) is more commonly known by Athenians as "ilectriko", distinguishing it from Metro lines 2 ,3. The first train from Piraeus and Kifisia stations is at 05:00 AM and the last train at 00:15 AM. The first and last scheduled train from intermediate stations between Piraeus and Kifisia can be found in the following timetable. Metro line 3 is the best way to reach the airport from the center of Athens. Trains are scheduled on line 3 to/from the airport every half an hour with the following airport route timetable. Trains on line 3 that do not go to the airport have a terminal stop at Doukissis Plakentias Metro station. LIVE Train Locator allows to check in real time the suburban trains location, and their scheduled arrival time to the stations. 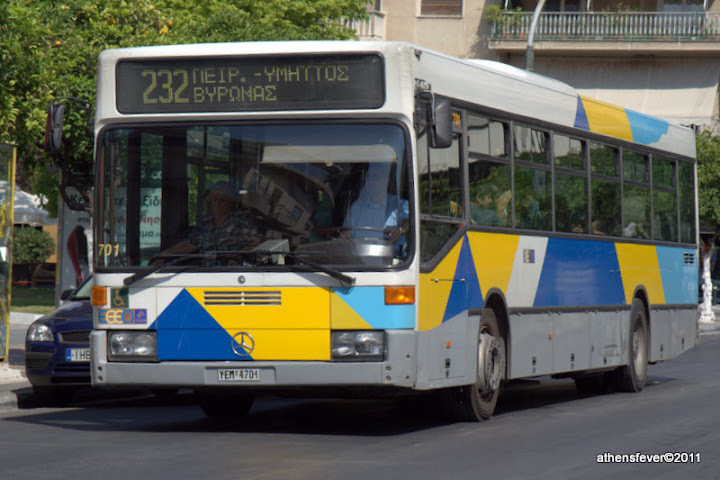 The site http://telematics.oasa.gr gives the time tables for buses and trolleys lines in Athens, as well as real-time information allowing you to know the bus arrival time at a given bus stop. Bus lines number #040 - #500 - #790 - #X14 - #11 are available after from midnight till 6:00 AM except for line 040 that is available for 24 hours. Lines that serve the Airport are known as Airport EXPRESS bus lines are also available 24 hours. These lines are: (lines X93 - X95 - X96 - X97). To get on and off a bus or trolley use the middle or rear doors. If your ticket hasn't been already validated, you can do it in one of the validation machines in the bus/trolley you are boarding. The most common used ticket is the so called "Integrated ticket" that is valid on all transportation means for 70 minutes. There are a few exceptions: the integrated ticket is not valid on Express bus lines to/from the airport, on Metro and Suburban rail to/from the airport and on 122 (E22) bus route between Varkiza-Saronida. All tickets need to be validated on validation machines before using any transportation mean. These machines are found within the buses and trolleys. On Metro, the validation machines are found at the entry of the stations. Validation machines for trams are found on the boarding platforms. Tickets are bought from distribution machines found in Metro stations and Tram stops or at ticket offices in Metro stations. At the Athens International Airport, you can get a bus ticket from the kiosk outside gate 5, at the arrival terminal (ground level). 5 days tickets are available for 9,00 euros. Not valid on line X80, and from/to the airport. 3 days touristic ticket for 22 euros. Which includes one free transportation from/to the airport. Transportation is free for children under six years old. Bicycles are allowed in the Metro system provided the last door at the end of the train is used. A maximum of two bicycles are allowed at a time. This mobile application allows you to purchase online your tickets for Athens Public Transport. Your mobile phone is your ticket, and saves you time for your transit in Athens. With this new mobile application offers real time monitoring of buses schedules and arrival time. It also contains timetables and routes.